The Harrison family owned a 220-acre tract of land that had been in their family for three generations, dating back to 1882. 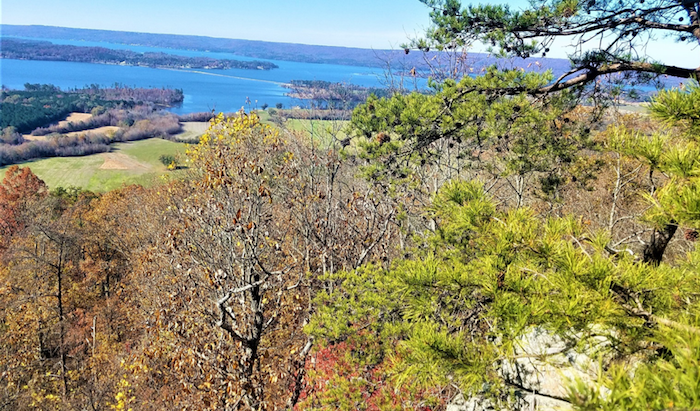 The land borders Lake Guntersville in northeast Alabama and had been partially farmed for cattle, horses and timber. The fourth generation was due to inherit the land, but recent economic challenges had the family worried whether keeping the land was a financially viable option. The State of Alabama designated the cliffs and caves on the property as rare habitat in its Wildlife Action Plan. These rare habitats provide a safe ecosystem for approximately 30 cave dwelling species. Most of these species are extremely sensitive to any disturbance of the fragile cave environment. Additionally, the endangered Indiana and Gray Bats reside in the area, which seek sheltered habitat in which to live, just like the caves found on the Harrison property. The family’s goal was to pass the property onto the fourth generation and ensure their most valuable asset, the land, would still produce wealth for the family heirs. However, the cost of property taxes and the upkeep of the farming operation exceeded the amount the family earned from the land. The Harrisons also considered other ways to generate income like leasing the property for hunting or harvesting the timber; however, that small amount of income did not warrant holding onto the land. The Harrisons decided they would pursue one of two options: One, sell the land outright to a developer and receive a significant financial return on its sale; or two, work with a land trust to donate a conservation easement and help preserve the land, and in doing so lower their property tax and maintenance burden. After exploring the manner and costs to conserve their property, the Harrison family found the financial burden too high to fully assess, appraise and make a conservation easement donation and so they had to abandon that pursuit. Fortunately, a third option presented itself when the family was approached by a group of real estate investors who wanted to acquire an interest in the land. After meeting with the Harrisons and seeing the land up close, the partners were persuaded that, given the conservation value of the land and tax benefits, a donation of a conservation easement was a viable option in lieu of developing the property. Allow the Harrison family to own the protected land and assuredly pass it down to the next and future generations. Allow the family to continue its timber management and harvesting per the county’s timber management guidelines and allow hunting on the property. Allow the perpetual conservation of rare habitats designated by the State of Alabama as worthy of protection. Allow the property to serve as a habitat for rare wildlife, including the endangered Indiana and Gray Bats. “By working with a real estate partnership, in addition to having a suitable financial option, the Harrisons were able to protect important lands and parts of nature that otherwise would have been lost to development,” said Scott Smith, President of the Barn Group Land Trust, whose land trust accepted the conservation easement donation. This successful conservation effort would not have been possible without private individuals, from the Harrison family members to their new real estate partners, who all came together to protect a pristine green place and wildlife habitat that is designated as important by the state and includes federally protected species. This case study highlights the role the private sector can and should play in maintaining a healthy balance between economic growth and protection of valuable land resources. This successful conservation effort would not have been possible without private individuals, from the Harrison family members to their new real estate partners, who all came together to protect a pristine green place and wildlife habitat that is designated as important by the state and includes federally protected species.